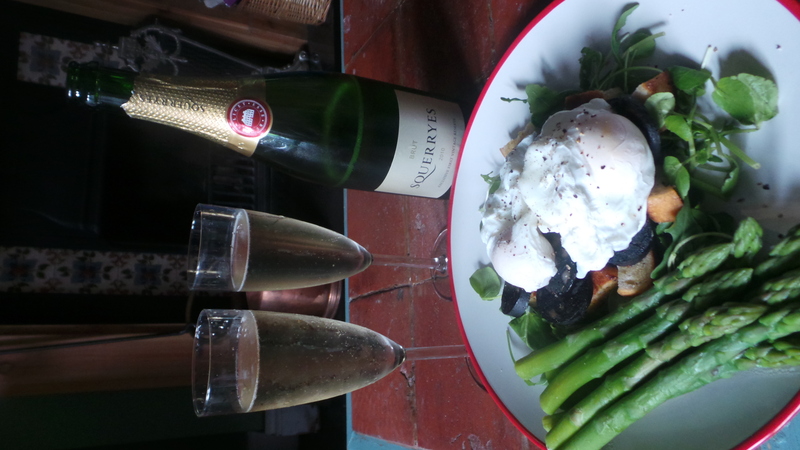 We have been lucky enough to be given a first bottling of Squerryes sparking wine grown in our own home town of Westerham in Kent…. and you know, it ain’t half bad! Henry and Claire Warde first planted vines on the Squerryes Estate in 2006 and their first bottle of wine has been a long time coming. We were flattered to be offered a bottle of the first vintage a couple of weeks ago and had been saving it for a special occasion to crack it open. However, reasons for celebration seem few and far between at the moment (long story). So, we decided to simply celebrate the end of a rather hard week instead. 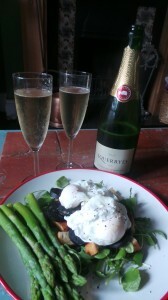 We had ours with a warm salad with Kentish asparagus, poached egg and black pudding. Perfection. We are very lucky to live in the Garden of England with some the the best English wine right on our doorstep. In fact, that is soon to be almost literally the case. Henry is about to begin building his vineyard a spit from our house. If you have not tried English wine you are missing out. Forget the French stuff, English wine, in my view, can be far nicer. You cannot go wrong with wine from Denbies, Chapel Down or Biddenden. Go get some!